Adding offline support for Google services turned out to be a difficult task: even if Gears-enabled versions of Google Calendar and Gmail have been tested for more than a year, offline Gmail will be available starting from today in Gmail Labs. What's the point of creating an offline version of Gmail when you can use mail clients like Mozilla Thunderbird or Outlook? You don't need to install additional software other than Google Gears and you can continue to use Gmail's familiar interface. "Once you turn on this feature, Gmail uses Gears to download a local cache of your mail. As long as you're connected to the network, that cache is synchronized with Gmail's servers. When you lose your connection, Gmail automatically switches to offline mode, and uses the data stored on your computer's hard drive instead of the information sent across the network. You can read messages, star and label them, and do all of the things you're used to doing while reading your webmail online. Any messages you send while offline will be placed in your outbox and automatically sent the next time Gmail detects a connection." "And if you're on an unreliable or slow connection (like when you're "borrowing" your neighbor's wireless), you can choose to use "flaky connection mode," which is somewhere in between: it uses the local cache as if you were disconnected, but still synchronizes your mail with the server in the background." Since this is still an experimental feature, Google chose to come up with an algorithm that decides which messages are cached locally and you can't set how many messages are downloaded. * Synchronization is based on the date of conversations. The system estimates a period of time to cover (at least 1 week in length) that results in approximately 10,000 messages being downloaded. For an average user, this means Gmail will end up downloading several years of mail. * Additionally, we'll download any conversation marked with a label that contains less than 200 conversations, has at least one conversation that has been received in the last 30 days and also has at least one conversation that's outside the estimated time period. For many users, this list of labels will include Starred and Drafts. * Finally, the system determines a list of labels to exclude conversations from being downloaded. For example, Trash and Spam are always in this list, along with any label that contains mostly unread conversations (unread count greater than 99%). So, we won't download a conversation if it contains only labels in this list. A typical Trashed message will not be downloaded, but a Trashed message that contains the label "alpha" will. Among the most significant limitations of the offline versions: you can't add attachments to your messages, the contact manager is not accessible, the search results are limited to the local cache. Make sure you use a browser supported by Gmail Labs and Gears: Internet Explorer 7.0+, Firefox 2.0+, Safari 3.0+, and Google Chrome. You can't use Gmail Labs in Internet Explorer 6. Wait until this feature is added to your account. When you see "Offline Gmail" in Gmail Labs, enable the feature, save the changes and click on the "Offline" link that will be displayed next to your username. 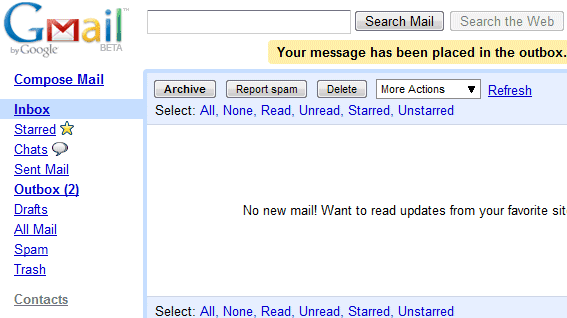 if someone installs Gears there and you check your Gmail... you'll get lucky (more or less :-). I guess there's a way to clean the Gears' cache, but how many will do it? This is huge. I have constant access to a pc but not always a connection. I have a desktop at home and in my office at work. I have a laptop installed in my truck and have one at home. If I have none of those I still have my Blackberry. The laptop in the truck is where I suffer connections the most. I use a t-mobile wireless card but I don't always have a connection. I have Gmail running simultaneously on all of them. I don't recommend to use Gears on a public computer, but I doubt the computer will have Gears installed. I like it. I would like to see more control of what is being downloaded but it is a question of a few months I think. Awesome! Ive been waiting for this for so long! I'm sure it will at least require you to 'log in' locally with your email account (no password) like offline Google Docs. But I agree with Alex Chitu that using Gears on a public computer would be insecure. The local SQLite database is not encrypted or password protected. Gears relies on OS security (user accounts, etc). Since Gears is really HTML 5.0b, I suppose HTML 5 browsers will have an option to disable the local database on public terminals. Where is Gears for the iPhone/iPod Touch? No "Sending messages with attachments" ???????!!!!!!!!!!!! @GreatSlovakia: thanks for the technical explanation. But, this is a big feature missing I think. Too bad gears cannot handle this. @Anonymous: Since you can't send the message while you're offline, you always have the opportunity to add attachments once you do get online later. Regarding offline mode on public computers... Let's say you have this option enabled as one of your lab features and you launch Gmail on a public terminal that has Gears installed. I would expect that Gmail warns you about the fact that you're about to create an offline copy of your gmail on this machine. Gmail downloads the messages and their attachments. The only issue related to attachment is that you can't add files when you compose messagess offline. Whatever happen to Gmail themes for Google Apps users? Never got them. I am waiting when it will be enabled in my account for a test. Someone, please do it for me! Tried to activate the feature within my Chrome browser, but Gmail told me that I had to install Gears. Turned out that my Chrome version was not the latest one. Make sure that you upgrade to the latest version of Google Chrome if you run into the same problem. I still have no offline mode in my Gmail, but if I understood correctly the GReader should have a similar algorithm for caching and download items, something more elaborate than "Swith offline button to download the first 2000 unread items"
At least they are on the right track. Anyone knows where all these messages are being saved on the hard drive? Which folder? Location of cached files. You should find the files in a subfolder named mail.google.com. 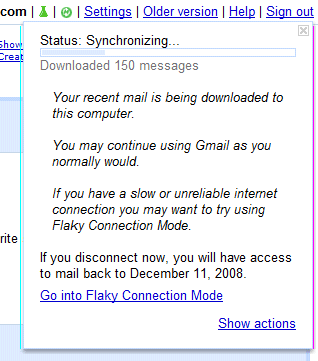 nice feature i was waiting for toooooooooooo looooooooong for an offline gmail. I use mozilla mostly but I cannot get this to work with mozilla. I downloaded gears and enabled offline but in mozilla everything freezes when I try to click the offline button. I then opened chrome and everything works fine. Can I only use one browser? Post bug reports to the Offline Gmail Group. Try enabling the Gears integration from Settings/Offline. Where exactly Google Chrome stores all that files on Win XP? If my Gmail is 5 gigs full does that mean I need that much on the PC? Found about the Location of cached files. The second question remains. Just synced, same space used as in Gmail! Would be cool if there is an option to exclude attachments. btw is it possible to sync more than one account? When I receive gmail in French, advertising links automatically turn to French, also. They flip back to English when I read an English e-mail. How do they do that? Isn't mail private? Where does gmail copy files at my pc for offline working? how can I delete the emails that "gmail offline" has been downloaded? Read the comments before asking a question. I've already posted the location of Gears cache. I do not want to download attachments in offline gmail! how do i stop that? as soon as i can choose where the offline data is stored i will use this feature gladly, but my c drive is for programs only, it's too small for an email cache. Hello, I'm using the offline mode. Its fantastic but I would like to know how the files are stored and where in my hard drive. And how I can put a password for the offline gmail. It doesn't works on my new Mac unibody + Firefox. Everything seems to work ok, it syncs emails and attachments, but when I connect again to gmail, sync is missing and I must start process again. I reinstalled gears a couple of times, but problem is not solved...allways asks for a new full sync. I like this, but what file path is the mail stored? I don't have too much hard drive space left, and it seems like my space keeps on drifting dangerously close to 0. Is there a way to check how much space gmail offline is using? Is there a way to set it? Great idea and feature. But where is Google actually downloading my mail? I clicked around in it's interface and there is absolutely no indication of local file system path. Also a very! good enhancement to this would be to allow a user to choose his file path. (1) No attachments when in off-lone mode – that means no pictures, no forwarding of email with attachments, it even mean no icons or avatars in your signature block. (2) No ability to control what is (and isn't) downloaded and stored in cache. You might not think this isn’t important until you blow your download limit when Google decides to use the internet to move 3 years worth of email to your hard drive which they encouraged you not to delete because they offered endless free storage. (3) What happens if you use multiple browsers on the same client platform – which browser knows about what? (4) What happens if you run multiple platforms – a Desktop, a Laptop, a Netbook, and possible even a Smartphone. How does synchronisation occur across multiple browser and multiple platforms. What, for example, happens to multiple off-line caches stored on separate hard drives when you create and send an email using one platform, synchronise on another, and delete an email from another. (5) What happens when you use a platform you don’t own (friend, café, hot-desk at work) which is “Gears enabled”? What the bl00dy h3ll were Google thinking? Not a lot obviously!! All Google needed to do was allow fat-email clients like Outlook and Thunderbird to synch up with their Gmail mail servers -- just like you used to be able to do with Outlook Express and Hotmail before Microsoft went soft in the head and banned it. For those not impacted by the above limitations … fine, but your requirements seem so simple why would need offline email; but for those who will be impacted, why commit to something which you can’t control? I’ve been waiting for well over 12 months for Google’s major offline application to materialise and then matured, and I can tell you the wait definitely wasn’t worth it. if you can see all these problems, you can see how to work round at least some of them. 2 - if it's doing too much at once, you can pause the downloading. have you actually looked at this? The only mind I’ve made up is that unless a new feature or capability decidedly makes things cheaper and/or less complicated – I don’t need it. So, what I don’t need is a different way to achieve the same end – because all that does is present a new learning curve and a new set of problems to solve. If Off-line Gmail doesn’t significantly overcome existing limitations or complexities in the way we work with e-Mail without adding its own set of limitation and complexities – then I’m guessing the world doesn’t really need it (as Google have discovered by having to drop so many of its other “experiments”). BTW -- I have Hotmail, Gmail, and Yahoo e-Mail accounts and so have a reasonably broad appreciation of the “big 3” web-mail providers … and to maintain a balanced perspective I also use Outlook, Outlook Express, and Thunderbird. In case you’re wondering -- one reason to use multiple browsers on the same platform is because Hotmail and others web-mail providers don’t permit multiple instances to be active in the same browser (ie: concurrent logons to different accounts) … hence the need to fire up multiple different browsers. What a pain – which just proves these companies don’t eat their own dog food, they just on-sell the end result. And I do agree that setting up a fat e-Mail client to work with a broad range of e-Mail service providers is way too complicated – in fact it reflects the very origins of e-Mail pre-WWW and seems not to have moved on since. So, all Google had to do was apply their enormous intellect and make that bit simpler so we could all give three cheers and sign up for another Gmail account. Oh, and also just for the record – My day job is identifying flaws in major new product - post design / pre-release. IE: I identify what the architects, designers, and developers failed to foresee – which believe me is often blindingly obvious. It sounds like you need a very rich application for what you want - this is(seems to be) a simple tool for solving the problem "How do I read my email when I don't have an internet connection?" In my case it just makes my home use of email a little easier - it doesn't need to be a massive improvement or do something never seen before if it just makes email use a little easier. I have Gmail, Yahoo & Facebook(Does that count? I use it for messaging in the same way, though it's rather simplistic) accounts and also use Outlook. What they have done is approach it from the other direction - starting with webmail & moving towards a client style service and it has a lot further to go to get to what you want. I love the option of offline access, but this is a no go for me because there is no password protection. The whole family (and the occasional friend)uses the computer. There needs to be some kind of access control. Anything in the works? Can any body explain me what is the difference between Offline gmail and Setting gmail in out look. I can see it takes lots of Space from my hard disk. after installing and downloading the mails, what if i want to disable the feature and delete the downloaded mails? what do i do? Would be nice if you could set the downloads to only be for 'unread' emails or for 'the last 200' emails. I'm a high-traffic user and 10,000 emails is way too much for my tiny hard-drive. Would also be nice if you could change the file-path so that it saves emails to an external/removable hard-drive. my c:drive is only 4GB and is nearly full. So I need an option to choose d: drive for gmail savings. where does store offline gmail file? i used gmail offline on chrome but when i use Firefox it doent shoe offline mode. When I activated offline mode in Firefox it start downloading my all mails again..so is it mean Google gear download once copy of my all mails for chrome offline mode and one for Firefox offline mode??? I installed offline gears and since that time I have problems with opening gmail. It shows every button at the top (like archive, report spam, etc.) bottom by bottom instead of side by side. Also does not open gmail s.times offline. Why it's difficult for Gmail team to allow label selection for offline access? Why Google always has to make decisions for us? Everyone knows how good a AI algorithm is, it can't fit for everyone!! For me, the algorithm that selects automatically which folders to synch selected the two most useless folders, and omitted the Travel folder where I keep all my travel arrangements -- THE folder I need offline. Oh well, time to download Thunderbird I guess. Sad to see them miss in such a silly way. Cool option but i hope password protection will be added to the tool and besides i wonder if and how the mail is secured/encrypted. where can i see all the messages and attachments in my hard disk..???? Half of you people are a bunch of IDIOTS. You are whinging that it downloads it to your hard drive and you dont want it to, thats the whole purpose of it. It downloads it to your hard drive so when you are offline you can access your emails. Simple!!!! Thats how it works, if you dont like it dont use it. I think it works fine, I work offshore on oil rigs and internet comes and goes all the time and to be able to access my emails is a life saver, Brilliant work Google! 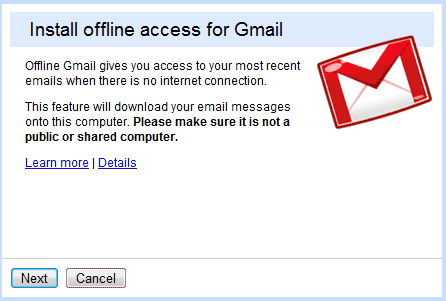 Can I create two offline gmail account in one PC? If yes, please show me the way how to do it. Would like to store the offline gmail on an external hard drive. Make that available and you are onto a winner. Well - this feature is working fine for me, can anybody suggest the way how to download those files as Outlook data file thereby we can simply view it in Microsoft Outlook or Thunderbird. @Alex can I change the location of the Google Gears Cache? 1) What's Gears? Do I have it, find it, buy it or what? 2) Can't find this offline feature in Labs. 3) Can I sort, copy or edit the downloaded mail in Word? What I really want to do is to archive (on my hard drive) some folders of my Yahoo mail, so I can leave Yahoo behind for good and have access to the important stuff on my computer (Mac OS 10, Firefox 3.6.3). Can I do this? If not through Offline, some other way? Still no comments on how to password-protect it offline, guys... I think this is a feature that Google overlooked. You can't password-protect it. This feature will soon be dropped and replaced with a similar feature that uses your browser's local storage. Google Gears is no longer developed, since it's no longer necessary, now that browsers implemented HTML5 features. HTML5 local storage doesn't support encryption either. Browsers only encrypt passwords, not browser history, cookies, cached data, because encrypting data decreases the performance and doesn't have too many benefits. I set gmail to off-line. works great, but now I want to return to on-line, but in configurations menu the off-line option disapeared !It is there that gmail recommends you to disable off-line! Help! How can I delete all the data downloaded by gear on Chrome and IE? When is it going to be available on Firefox 4.0.1??? i am using chrome vr-11 on win7. "Offline Mail is not supported by your browser.."